Traveling Can Be Green, Too! Happy Earth Day! Most of what I write here is creative ways to travel that will save you green. But in honor of today’s holiday, I’m going to shift gears a bit and talk about another way to save the green. Many environmentalists frown upon travel as it causes greenhouse gases and a bigger carbon footprint. True, carbon costs associated with travel can be astronomical, but that doesn’t mean it can’t be cleaned up and greened up. Since Earth Day is celebrated each year on April 22nd, here are 22 ways you can make your travel more green! Share your campsite to make an even lower impact! Stay in Hostels Staying in a hostel dorm with others requires less square footage and encourages community. Hostels also often tend to buy in bulk and cut out worthless amenities, so you won’t create excess waste with miniature shampoos. Go Camping Get in touch with nature, and then be encouraged to preserve it! Any kind of camping is probably helpful for the environment, but you can take it a step futher with primitive camping, where you won’t have electricity hookups, WiFi, or possibly even flushing toilets! Stay with Friends Instead of creating a demand for a temporary place to sleep, go somewhere that’s already being lived in. Your friends will probably equip you with the same shower, dishes, and bedding they always use instead of providing disposible or temporary supplies like a hotel does. Don’t Request Sheet Changes Unless Absolutely Needed In your own home, you probably realize that washing sheets from just one bed is enough to load an entire washer and dryer. Save the water, soap, gas, and electricity by skipping sheet changes. You don’t replace your sheets at home every day, do you? Unless you need a Delorean because you’re going on a time-travel vacation, don’t pack enough to fill a truck. Bring Your Own Toiletries in Reusable Containers I’ve shared some of my favorite travel toiletry containers here before. Whether you use my recommendations or not, siphoning toiletries from bulk containers into smaller, reusable containers is much better than purchasing one-time bottles from the travel section of superstores. Lighten the Load with Carry-On Only No matter which mode you travel with, you’ll always save fuel if you take a lighter load. I backpacked the Mediterranean for 92 days with just a carry-on! I think going on a weeklong vacation with only a carry-on is a piece of cake. Borrow or Buy Used Travel Gear There are some items that may be necessary while traveling, but useless in everyday life. If you absolutely cannot go without it, ask your friends, family, and social media followers if you can borrow their tent, or ice chest, or lawn chair, or… you get the picture. Do Laundry Effectively If you need to do laundry on your trip at all, first see if there is anything you can wear more than once between washes. Bring your own eco-friendly soap instead of the single-serve packets found at the laundromat, and try to line-dry your laundry, even if you have to do so indoors. You could travel by boat for a really fuel-efficient getaway. But if going by raft, you may get wet! Carpool If someone else is available to travel with you, going in one car instead of two will cut your emissions in half. Better yet, if you’re both licensed drivers, split the driving time to help keep alert and avoid accidents. Take the Bus or Train I love both of these options! You get to see so much more of the country, and reap the benefits of extremely low passenger miles per gallon! Trains are often a vacation in themselves, and long-distance buses make travel available to all income levels! Walk or Bike Everywhere at Your Destination Make a point to do this everywhere you go, even if it means staying closer to the city center. I can’t imagine all that I would have missed out on if I took cars or city transportation everywhere I’ve been. Don’t Fly First Class I’ve flown first class one time, and it was WAY overrated. Flying in coach means that the seating allows for more passengers to fly (and thus cuts down on emissions per person), plus lowers the waste of beverage cups and snack wrappers. My take-away container was already full when I bought these in Paris. But I could recycle the cardboard and bag! Pick Restaurants that Serve Local Food You’ll get a better sense of the local cuisine and prevent excess trucking and shipping of food. Become a Vacation Vegetarian I’m not saying you have to give up meat. (Not everyone can!) But try to select veg options in your travels. Besides the environmental advantages, vegetarian options often cost less, and you will be less exposed to those icky stomach bugs that travelers fear. Bring Washable Dishes or Stay Somewhere that Offers Them It’s not that time-consuming to wash your dishes after eating instead of throwing them away. BYOB (Bring Your Own Bottle!) Vacations tend to make me thirsty! Instead of buying drinks everyday, I’m saving my wallet, my waistline, and the Earth with a reusable bottle. See those love locks at practically every major attraction? Skipping this activity will reduce the waste of the lock and packaging, reduce the pollution caused when the key is tossed into the water, and reduce the repairs needed on the structures that are getting vandalized and weighed down! Recycle Ticket Stubs (or Use an eTicket) These are usually recyclable, but rarely do people think to recycle them! Visit Local Parks Fresh air, green plants, and a free place to explore the local culture. What’s not to love? Borrow Books or DVDs for Downtime Sure, you could buy a paperback for those times you need to relax. But many hostels, and now even some hotels, offer lending libraries or book/movie exchanges. Reduce the demand for new materials, and lighten the weight of that carry-on you brought! Visit Ethical Attractions What you define as “ethical” is ultimately up for you to decide, but consider how workers are treated, how animals are used, how waste is disposed of, and how guests can contribute to the community. Arnold Schwarzenegger bought this bear statue as a souvenir of his time as governor, but then left it at the California State Capitol! I guess he couldn’t even fit it into his suitcase. Avoid It Why do you need a tacky souvenir (that’s probably not even made at your destination), when there are more effective, and more eco-friendly, ways to capture your memories? 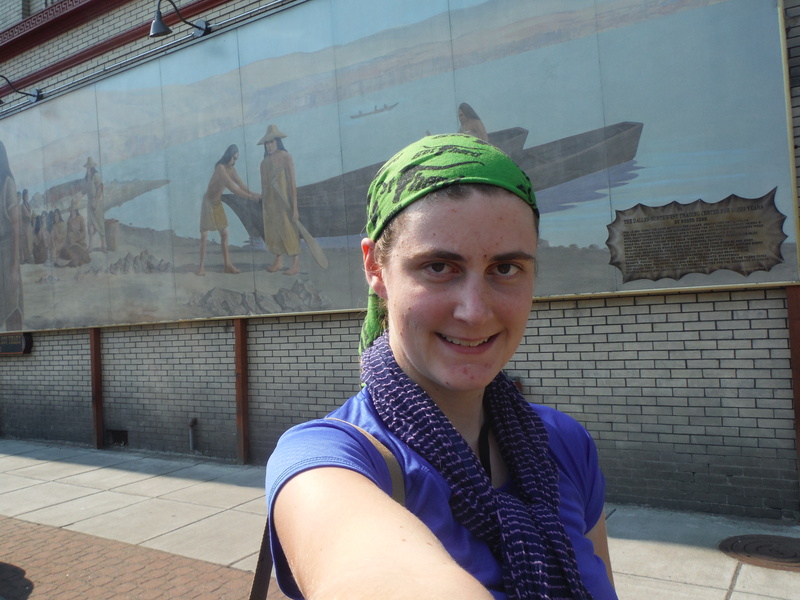 One of my favorite mementos are my travel journals. Photos are another great option, or if you absolutely want to buy something, send yourself a postcard or letter from your destination. 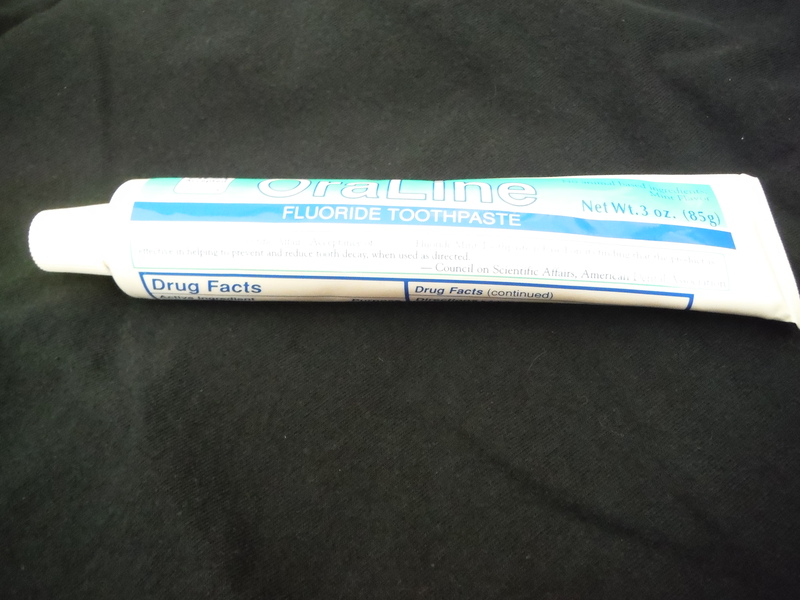 A lot of toothpaste tubes are actually perfectly fine to take in your carry-on. Remember that the TSA limit for liquid carry-ons is 3.4 ounces (100 milliliters)- that’s a lot bigger than most things labeled as “travel-sized”! If you’re going on a week-long trip, one of the free sample-sized tubes that they give out at the dentist office will work fine. (If you run out of toothpaste early, cut open the tube for about an extra day’s worth of toothpaste.) If you need more toothpaste for longer trips or because you’ll share with others, look among the normal-sized toothpaste instead of the travel section. I found a three-ounce tube, so I’m set! Many travelers swear by Dr. Bronner’s Castille Soap. I do take a small bottle on most of my trips because it the condensed formula lasts a long time, but it’s not exactly my favorite. I don’t use Dr. Bronner’s at home because it’s not as effective as other soaps and tends to leave a residue, especially when being used as a shampoo substitute. Instead, I use my Dr. Bronner’s once every few days and supplement with a solid bar of soap. The kind I use, both at-home and on-the-road, is a natural oil-based soap made by a company that gave me extras since I was the last customer just before it went out of business. So while I unfortunately can’t recommend a specific kind of bar soap (and I’ll sadly have to find another supplier when I run out of my last few bars), there are plenty of bar soaps out there for you to find one that perfectly suits your needs. I bring a family-size bar and cut it into chunks as I go so that only one small piece is wet. As a bonus, soap bars are like an air freshener for your suitcase! If you like to use the aerosol cans of bug repellent, it could be confiscated, even from checked luggage. 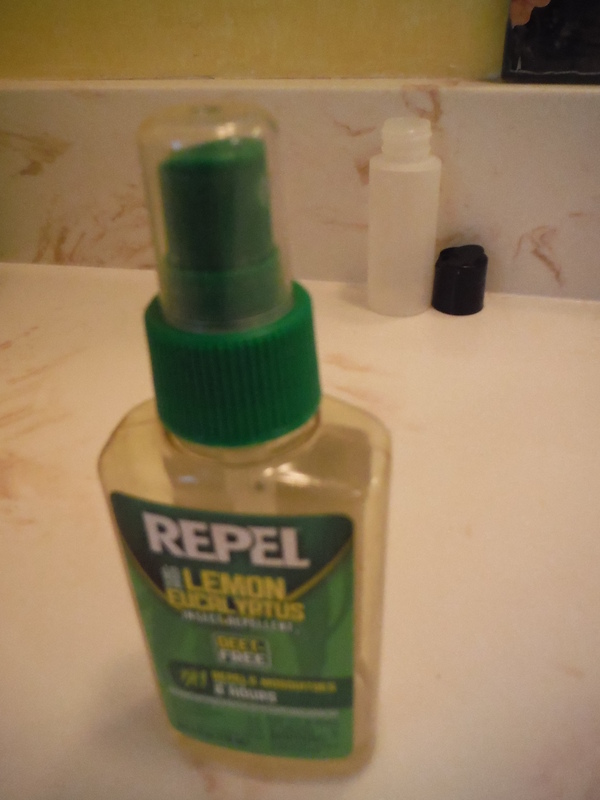 I prefer to use DEET-free spray, comes in a spray bottle instead. I wanted to use up my almost-full bottle of spray that I currently had, but when I checked the label, it was marked as four ounces. Yes, I think companies purposefully make four-ounce bottles a better deal so they can charge you extra when you have to go back and buy a 3.4-ounce bottle! 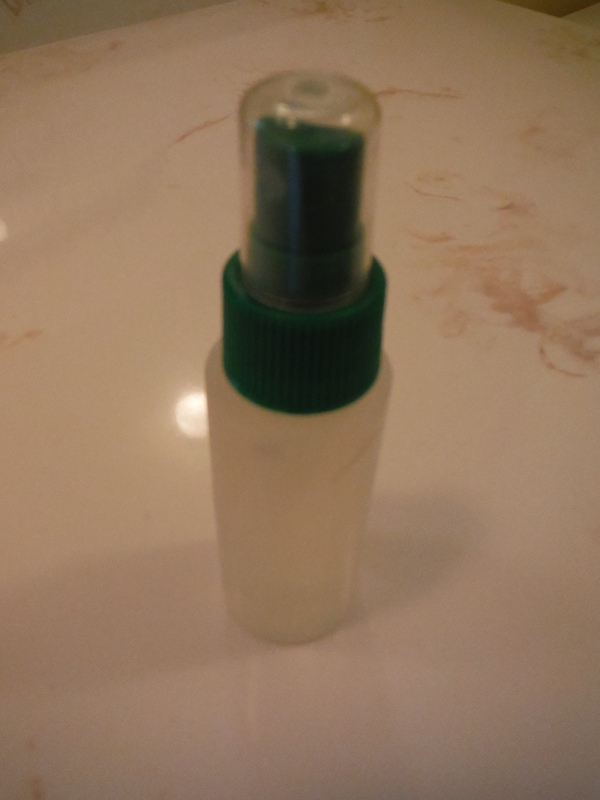 Instead of paying for an extra bottle of repellent, I instead decided to pour it into a travel-sized bottle. I do this with other liquids all the time, but this was the first time doing so with a spray bottle. Sure, I could just pour it into an ordinary bottle and rub the repellent on like a lotion, but I’m pretty sure it’s sold as a spray because that’s the way it’s most effective. Fortunately, I had a travel bottle that had the same exact size of opening as the original bottle, so I could just pop the original spray mechanism on the new bottle. Since this bottle was smaller, I had to trim down the hose so that the lid would fit on. Because I was afraid this might leak, I cut a small circle of plastic, poked a hole in the center, and slid it onto the hose before twisting the bottle shut. (You can put a piece of plastic underneath any liquid lid to prevent leaks, but unless it has a hose like it did in this case, you’ll have to remove it before you use it.) I also put a piece of cotton next to the nozzle to absorb any leaks, but so far not a single drop has leaked, and I packed this over a week ago! For my eighteenth birthday, a friend gave me a Mary Kay travel kit for my birthday, which included two small empty bottles that I could fill with my own liquids. 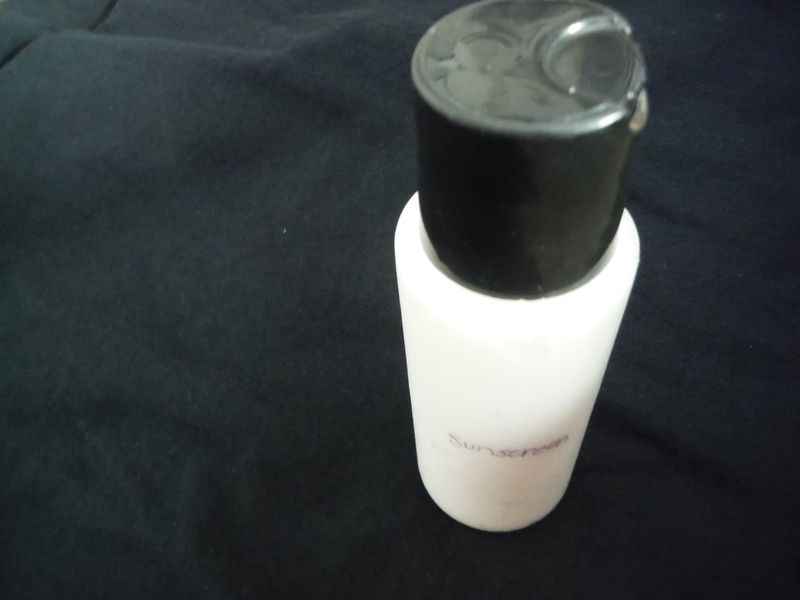 However, my bottles have outlasted their production, because Mary Kay no longer sells these. (But I recently found another brand of bottle, and I may like it even better. Just keep reading for a few more sentences and you’ll find out what it is!) For the past several years, these bottles have been filled with things like shampoo, conditioner, soap, and even liquid deodorant at one point in time. I think this is my first time packing sunscreen in them, though. Since I burn easily and will be outside quite a bit, perhaps one small bottle of sunscreen won’t be enough. I recently bought a sunscreen stick to supplement this liquid. I found it at an outdoor supply store in the fisherman’s section. Of course, hats and sleeved shirts help keep the harmful rays away, too! Many travelers don’t take shampoo at all since it’s provided in just about every single hotel room on the face of the planet. But some people have a specific brand that works best for them. And hostels are usually a toss-up in whether or not they provide shampoo. Plus there are other forms of accommodation, like camping and rentals where you definitely shouldn’t count on this. So while I’ll always jump at the opportunity to use free shampoo and conditioner, I am bringing something for those times when it’s not around. Now I can share my latest discovery in the world of traveling with liquids! I recently got a GoToob, and it’s filled with a shampoo and conditioner combo to start out my trip. 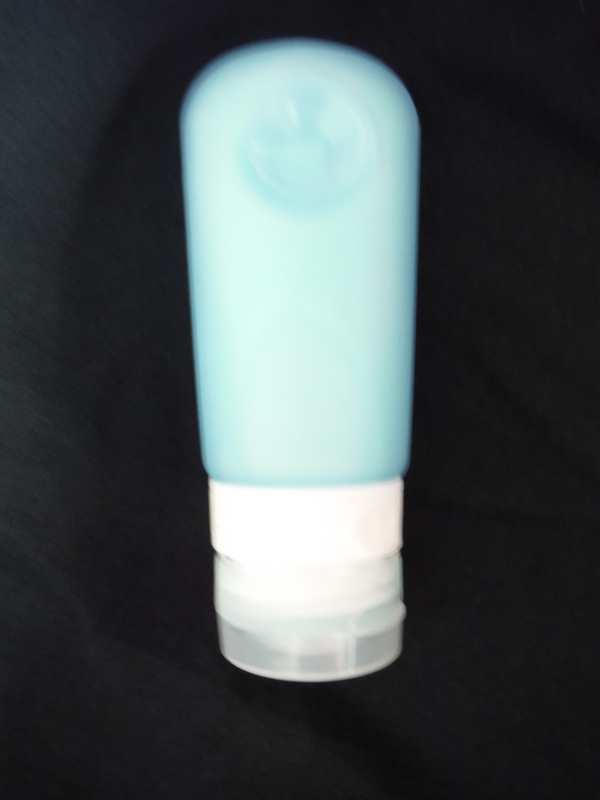 These are travel bottles made out of silicone, which means more flexibility and less possibility of damage. (But if they are damaged, they’re covered by a lifetime warranty!) While I still love my plastic bottles and will continue to use them for liquids that aren’t silicone-compatible, GoToobs are my new go-to travel bottle, and I don’t see myself pouring shampoo into any other container! Although the bottle size ranges up to 3 fluid ounces, I downsized to just two ounces because that bottle includes a suction cup, perfect for sticking on the wall of a shower that lacks soap dishes! And since GoToobs are food-safe, towards the end of my trip I may wash out the remaining shampoo and fill it with a delicious Greek or Turkish condiment to take home with me! As I travel, I will compare the silicone GoToob to its plastic counterparts and keep you updated on which works better! When I read about other long-term carry-on-only travelers discussing how they pack sample-sized detergent, I have to laugh. They do know laundry soap comes in powder form too, right? Even if you’re hand-washing, as long as you use warm water, powder soap will dissolve enough to be just as effective as liquid. 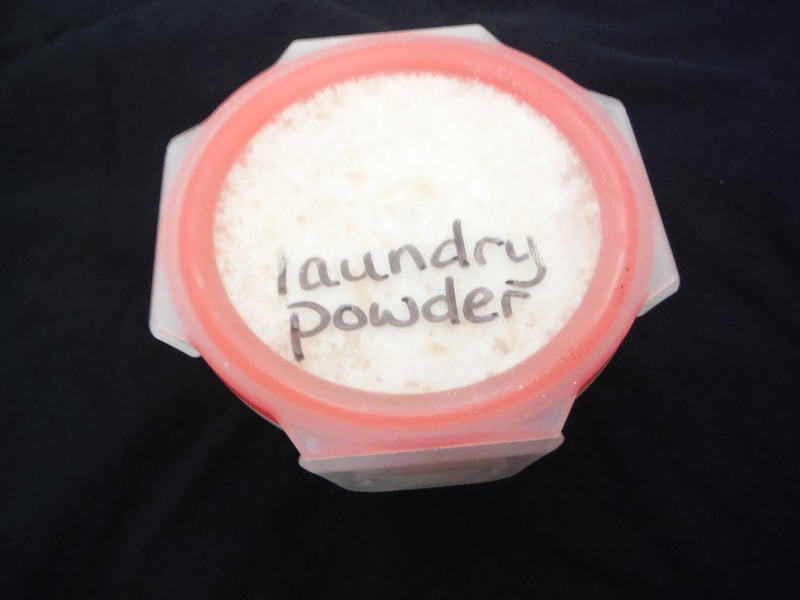 The only problem with laundry powder is that it tends to look… well, suspicious! I don’t pack any kind of powder in a plastic baggie, since people automatically think “drugs” when it’s packaged like that. I put it into Snapware containers and make sure it’s clearly labeled. Technically, anything that you repackage needs to be labeled, but at least with most things you can tell what it is by sight and smell. Since powders look suspiciously like something else, it would be suspicious for a TSA agent to get close enough to smell what it is! By the way, I bring a homemade laundry soap that’s so condensed, only one tablespoon is needed for a full load. You can find recipes like this online, but I’ve made a few tweaks for maximum effectiveness and traveler-friendliness. Would anyone be interested in getting the recipe for this or any of my other homemade travel toiletries? I got a free sample-sized bottle of mouthwash that I’m taking with me, but if you don’t have room or don’t want to buy a miniature bottle, this certainly isn’t a necessity. 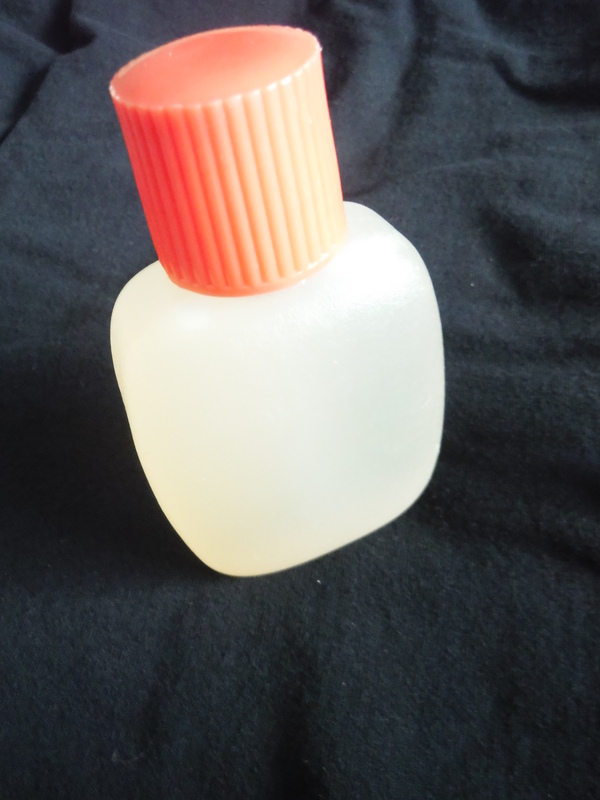 I am also bringing along tea tree oil. These typically come in small bottles anyway, so there’s no need to transfer packaging or look for something specifically travel-sized. The most important liquid might be hand sanitizer! I’ve been carrying the same little bottle around for over a year and can easily refill it from larger bottles of hand sanitizer. Hey, with as popular as hand sanitizer is, it can even be refilled for free along the road by using sanitizer stations at schools, hotels, and other public places. All together, all the liquids easily fit into the TSA carry-on-approved one-quart bag! This post was made possible by HumanGear, the newest sponsor of the Mediterranean European Trek! They provided products to use on my trip, but all opinions are my own. Stay tuned for more of my thoughts on different HumanGear products! 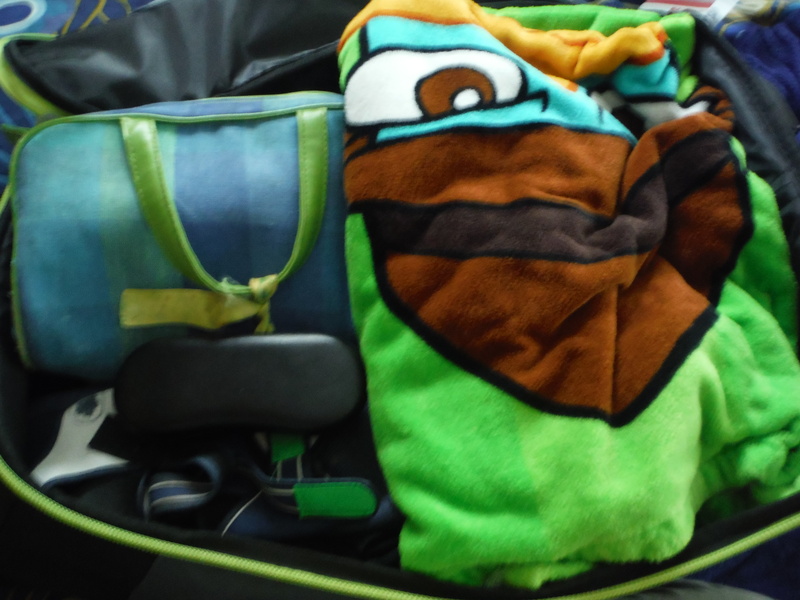 During after-Christmas sales last December, I got a bargain on the kind of luggage I wanted to take to Europe. It was a wheeled suitcase that not only featured a long enough handle so that my 6’1″ body didn’t have to slump over to roll it around, but it also contained hidden backpack straps for when I realize that a roller suitcase is not ideal for cobblestone streets! The front part (not shown in picture above) zipped off so it could be used as a daypack. It had nearly everything I could wish for in a a suitcase. It’s even the maximum carry-on size! I’ve used this backpack a few times since buying it, kind of like a test drive in preparation for the big trip. I’ve taken it to Wilderness Trails. I used it over the course of my tri-state California road trip. I also used it this past weekend for the outdoor retreat. 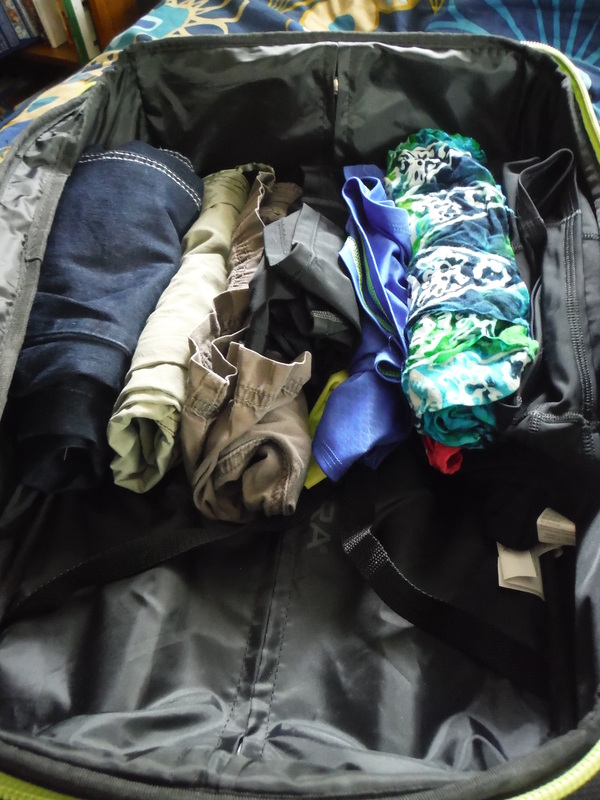 This time, I wanted to study my packing, and see if I can use this experience to learn to pack better. Since this retreat was for two nights, I would only need two changes of clothes, right? However, there were a few variables. I would probably want shorts or capris for this trip, but I had no idea where I was actually going. Would there be a breeze? Would we be in a shaded area? Would cold weather hit? Not knowing these kinds of variables, I decided to pack a pair of jeans and a long-sleeved under armor shirt. I also decided to pack three shirts since I figured I had a good chance of getting one dirty or sweaty. I also needed to pack swimwear. Since I don’t wear standard swimsuits, this meant that an extra swim tunic, bikini top, swim shorties, and sarong had to be packed. Still, in total, all these clothes took up about one-fourth of the main compartment. (Socks, hats, and undergarments took up little room in the front pocket.) Of course I had completely forgotten about sleepwear until the last minute, so I did shove in pajama pants and a three-quarter sleeved shirt right before leaving. Most of my luggage weight consisted of non-clothing. Since this was a camping type of experience, I would need to bring a pillow and sleeping bag. These two items on their own were larger than my suitcase, but for most trips (like Europe), these things are not necessary. The other items, as you can see in this picture, include sandals, towel, Camelbak, wallet, phone, glasses, sunglasses Bible, notebook, car keys, head lamp, flashlight, pedometer, mug, and bag of toiletries. I put the Camelbak and the small items that are normally found in my purse into the daypack compartment to ensure I had easy access to them. Everything else fit into the remaining space of the main compartment. Clothing was the main thing I over-packed. I ended up wearing my capris on both Saturday and Sunday (since there were only a few hours on Sunday that I wasn’t in my swimwear), which meant that both the shorts and jeans were unused. I did end up using the long-sleeved shirt as an extra shirt, but I still had one extra shirt even after that. I don’t drink coffee, and although there was some tempting-sounding hot chocolate, I ended up only drinking water during the entire trip. That meant my mug stayed clean and inside my bag. I only used my head lamp for light, so my flashlight was unnecessary. Other than that, there were several toiletries I did not use. I didn’t use soap (hey, we didn’t have a shower! ), nail clippers, hair tie, bug wipe (I had bug spray instead), cotton swabs, or the icy-hot patch. Most of the things I brought that I didn’t end up using were brought because I was unsure of what to expect. Now I know that it’s very important to do my research for every city I plan to go to in Europe. I will definitely be taking more clothes there than I did on this trip, but I’ll know that I can wear things multiple times, especially legwear. One piece of clothing it seemed like everyone but I wore was athletic leggings or fitted yoga pants. Seeing how versatile they were for sleeping, exercising, getting wet, staying warm, and simply hanging out, I went out and bought a pair yesterday! A few items I brought on this trip will not go to Europe in order to save space. The biggest thing I will not bring is a beach towel. Most hostels provide towels, and I’ll have a small towel for the ones that don’t, so this will free up about a quarter of the main compartment. I will also not bring my Bible. Now, as a Christian going on a trip for three months, that sounds weird, but hear me out. I love my full-size waterproof Bible for trips like these, but it’s just too heavy and space-consuming for Europe. Instead, I will bring the miniature New Testament with Psalms and Proverbs that the Gideons give out for free. If I want to read a passage of scripture not included in that Bible, I can always access it on my phone. Speaking of my phone, I will use that as my flashlight in Europe instead of bringing a redundant item. There were some “emergency-only” items in my toiletry bag that I actually ended up using. Fortunately I didn’t need these things for myself, but as the EMT/former Girl Scout of the group, others ended up benefiting. I offered a sample pack of bacitracin and a band-aid for a tick wound, and afterwards when everyone was doing a tick check, several ladies used my nit comb for closer examination. Hand sanitizer was also very useful throughout the trip- it was the only way to wash hands! One thing I didn’t bring, but someone else gave to me, was a Benedryl pill. This helped will all the allergens collected from the outdoors and also helped me fall asleep that night. Benedryl (well, the store brand of Diphenhydramine, at least) was already on my packing list for Europe, so I made sure to buy that yesterday, along with a couple other useful medications. Needless to say, I will bring first aid supplies along with me! These are just a few results from my packing experiment this weekend. I know that an outdoor retreat and urban backpacking Europe are two completely different beasts, so I guess I still have plenty to learn before cramming three months of my life into a carry-on and setting off! What is your all-time best packing tip? 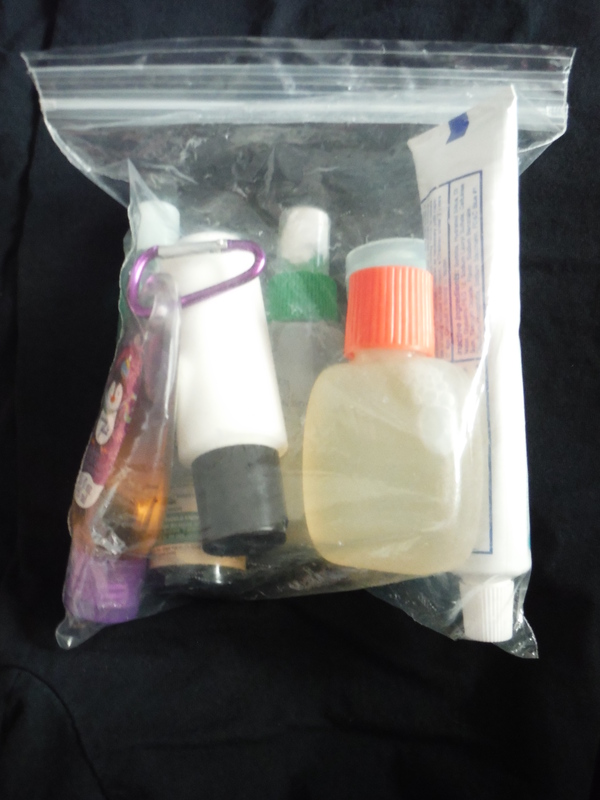 This is the first chapter of the series “Carry-On Toiletries”, for those of us who accept the challenge of traveling with just a carry-on, along with all the TSA requirements for taking toiletries. Stay tuned for the next several weeks for more installments of this series! I’ve had hair that ends at my ears and hair that ends at my waist, and every length in between. No matter how long my hair is, it has a tendency to cause problems in travel. At times it’s been so frustrating and unmanageable, the thought of shaving it all off entered my mind! Maybe you feel the same way too. But before you grab a razor, keep reading for a few tips on how to care for your marvelous hair, no matter where you are. Flat irons, curlers, and other large hair styling items sacrifice way too much space in a carry-on. It’s hard to sometimes even fit a hairbrush! I will usually pack a foldable brush or a flat, thin comb. But even if you style your hair perfectly each morning, the environmental factors of your destination, such as heat, humidity, rain, and even thunderstorms, can effect how your hair turns out. Flyaways, frizz, and uneven curls are far too common in travel. 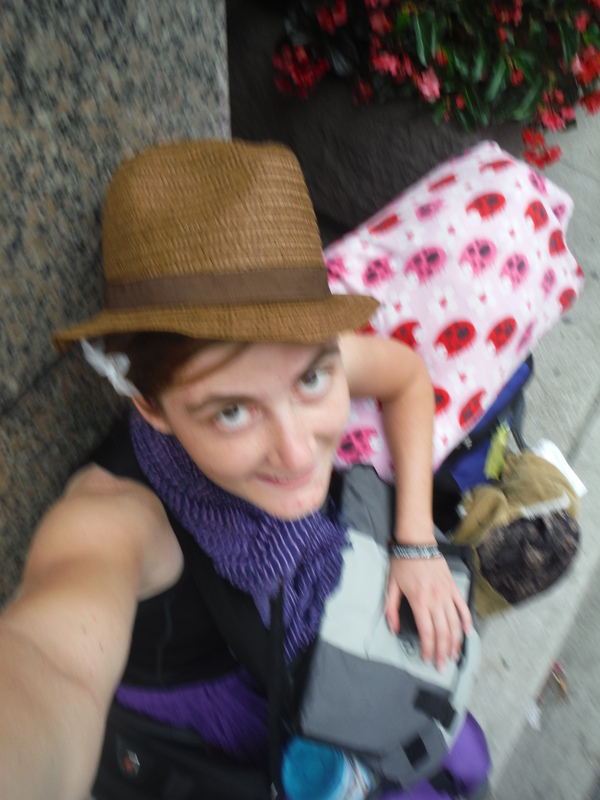 Rocking a fedora and ponytail in Chicago. This hat was great at not losing its shape despite being crushed among the rest of my belongings. Of course, the easiest solution is to hide it! A ponytail holder takes up zero space inside your carry-on. You can even slip it around your wrist for easy access! If I’m going somewhere that I know I’ll need sun protection, I’ll take a hat with a brim. I prefer bucket hats to ball caps because bucket hats are soft and can be crunched up to fit anywhere in your bag. Earlier this year, while attending a conference, I was given a sample product that changed the way I look when I travel. It was a buff, or at least a knockoff one called a Tubie. I can wear it as a headband, and if my hair gets too unruly, I can extend it to cover all my hair. If my hair happens to be behaving, I can keep the Tubie around my neck or on my wrist to absorb sweat. After spending a week riding the bus, hiding all my hair under my Tubie was the best I could do. Hats and tubies are great to hide problem hair, but what if you want to show it off? Maybe you want to show off a new hairstyle, or your outfit doesn’t match any of your headwear. For a long time, I didn’t know how to deal with this on the road. With TSA’s 3.1 ounce rule, you can’t really take enough hair product with you. For years, if I was traveling with a group, I might bum some product off someone who brought checked luggage. If I was by myself, I really had no choice but to hide my hair. But just a few weeks ago, I discovered a new product that offers a great solution. A new company called Zizilia created “The First Pomade Bar”. I didn’t even know what pomade was before finding out about this product, but it is a hair styling product that does a really good job at keeping your hair in place. 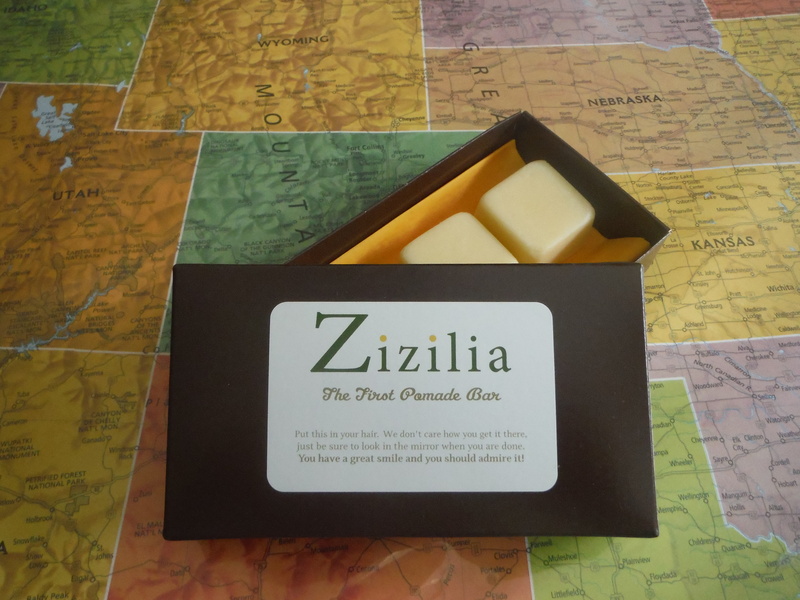 Zizilia makes them in solid bars, which means one less liquid that you have to take in your travels! The bar alone makes this pomade travel-friendly, but Zizilia went one step further and made them travel-sized! These cute little squares of pomade are great for plopping in your toiletry bag and taking anywhere. The reason this is a solid is because it’s made with beeswax along with other natural and organic ingredients, and I definitely prefer to not carry around unknown chemicals! This is the first Zizilia product I’ve tried, but they have dozens of other products that I’m excited to try out. How do you care for your hair in your travels? A big thank-you goes to the small business Zizilia for introducing to me and sending some great products!